Craig garnered his reputation as his generation’s “troubadour piano man” (Jambands.com), from his start performing in the bars and on the streets of Chile and Spain, living there in the early 2000’s. 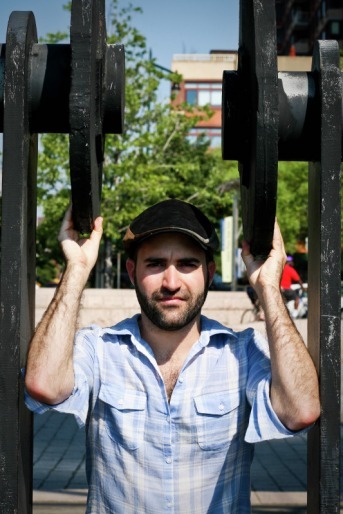 With his infectious melodies and musicianship reminiscent of Billy Joel or Ben Folds, Greenberg creates a sound that is at once both familiar and unique. His voice is filled with soul and personality, reflecting his New York City roots, and also his professional musician beginnings abroad. Touring nationally and internationally, Greenberg currently calls Queens home. In November of 2007, Craig co-produced and released his debut EP, entitled “The World and Back”. In August of 2010 he released his sophomore effort, “Spinning In Time”, which received airplay on almost 100 radio stations around the country, and on Pandora. The single from that record, “Our Own Way”, was placed in the 2012 feature film “Doggie B” by Jane Wiedlin, acclaimed songwriter/bassist of The Go-Go’s. His last release “The Grand Loss & Legacy” (LP, May 2015) is his most personal, and most rocking work to date. It was written up in the Huffington Post, and received national radio play and charted in the RELIX Top 30 Radio albums. The first single off the album “That Girl Is Wrong For You” was awarded Grand Prize Wnner in the Relix JamOFF contest and was featured in the June 2015 issue and CD sampler. Craig is currently working on a new album he plans to release in 2019. -In addition to performing his own music, Craig has had the privilege of performing with many esteemed musicians, including Jackson Browne, Chris Barron (Spin Doctors), Mike Gordon (Phish), Jerry Joseph, Louise Goffin, Jane Wiedlin (the Go-Go’s), Jerry Marotta (Peter Gabriel), Victor DeLorenzo (Violent Femmes), Stanley Jordan, Eric Mcfadden (George Clinton, Eric Burdon), Bernie Worrell (George Clinton, Talking Heads), Doug Wimbish (Living Colour), Angelo Moore (Fishbone), Alan Evans (Soulive), Ian Neville, Shaunna Hall (4 Non Blondes), Tom Freund, Wally Ingram (Sheryl Crow), Tony Hall (Dumpstaphunk), Steve Conte (NY Dolls), Alex Skolnick (Testament), Roosevelt Collier, Luther and Cody Dickinson (N.Mississippi Allstars), Nikki Glaspie (Nth Power), Papa Mali. He performed with songwriter legend Jackson Browne on several occasions, most recently as part of Steel Bridge Songfest 9 in Sturgeon Bay, WI–hosted by veteran songwriter Pat mAcdonald, of Timbuk 3. -Aug 2017 – The Craig Greenberg Band debuted at the Gramercy Theatre, NYC. -March 2016 – Craig’s song “Aberdeen” (unreleased) was featured in American Songwriter. -Sept 2015 – Craig performs at Lincoln Center in front of over 6,000 people as part of the 2015 Shinnyo Lantern Floating For Peace closing ceremony. -April 2015 – Craig’s song “That Girl Is Wrong For You” (1st single off his 2015 release “The Grand Loss & Legacy”) was awarded Grand Prize Wnner in the Relix JamOFF contest and was featured in the June 2015 issue and CD sampler. -Aug 2014 – Craig made his debut at famed NYC venue, Joe’s Pub. -July 2014 – Craig was ranked #1 on the ReverbNation NYC Rock chart. -June 2014 – Craig was mentioned in American Songwriter Magazine for a song he co-wrote with grammy nominated producer/songwriter Louise Goffin (“Deep Dark Night Of The Soul”) at Steel Bridge Songfest 2013. -June 2013 – Craig won runner up in an online competition and was invited attend Roots Rock Revival–a 5 day music workshop hosted by Butch Trucks and Oteil Burbridge of the Allman Brothers Band in the Catskill Mountains. -February 2013 – Craig was named as High Times Magazine’s Unsigned Band of the Month. -Nov 2012, Craig toured Israel accompanying songwriter Jerry Joseph. -January of 2011, Craig ranked #8 out of hundreds on a “Best Of NYC Emerging Artists for 2010” poll in the Songwriter category for Deli magazine. -April of 2010, Craig organized (and performed at) the “Concert For Chile” – a benefit for the earthquake victims, held at Brooklyn Bowl. The show was headlined by Chris Barron (of the Spin Doctors), and raised money for AmeriCares fund for Chile relief. The event received press in Chile, and elsewhere internationally, and a live webcast of the concert drew 1,800 viewers worldwide. -In addition to touring nationally, he has also performed in Costa Rica, Israel, Chile, Spain, Ecuador, and the US Virgin Islands.